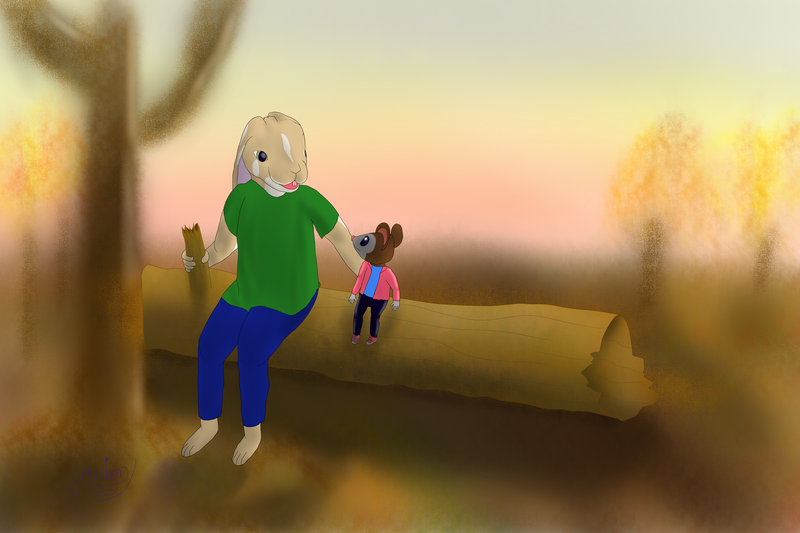 So I had the background nicely drawn up and really wanted to put something sitting on the log there...well I hadn't drawn anything of @DangerRodent2004 yet..so I figured why not go ahead and do that. So with that said, here is Junion talking with DangerRodent2004's character Henry Takamato. Cause yaknow..we both short tails and need to stick together and all that :). pointed out the log looked kind of floaty in an earlier version of this picture. And gave me some hints on how to properly ground it..instead of making it all floaty. So after a few changes to the shadows for the picture I've managed to stick things onto the ground a touch more. I really need to learn to be more 'brave' with my shadows seems to be the main point. That looks really awesome! = D Great job.